If you’re the kind of person who prefers the tangible, pulpy sensuality of actual real-life books, you’re in luck. A couple years back, we published a 200-page compilation of some of our least-questionable wisdom. This book also includes a review of the biggest portfolio programs. Although we’d advise you check for updated information with the schools, this will get you started. And we still stand by almost all of the advice in this book. This is what you get when two writers try to art direct a book. 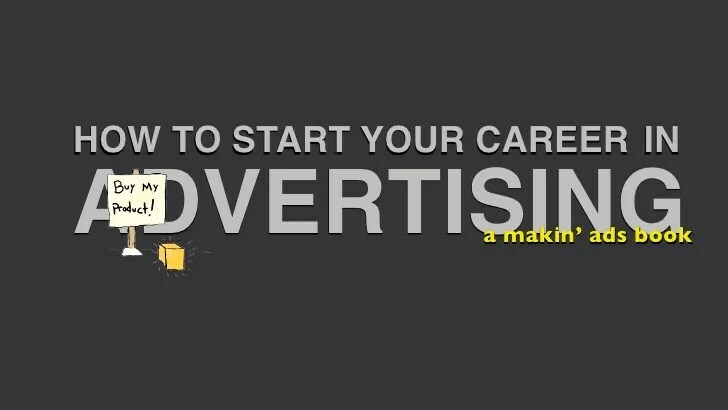 But in addition to questionable design and laughably bad illustrations, you get a primer for where to start if you’re thinking a career in advertising might be your thing. It’s not super in-depth (that’s what this blog is for), but it’ll point you in a direction. And maybe the best thing—it’s absolutely free. A simple one-page list of things to keep in mind as you put your portfolio together. Some questions that will help you step back, take a wide view and see if you have any glaring holes in your portfolio. You can download this one-pager here. Greg spent a few years as an American working in Europe. Here he shares some of his experiences and gives advice to anyone considering working overseas. You can download this e-book for free here. Even with all the technology in the world, Greg argues that the best place to start with an idea is still the blank page. It’s short. Give it a read and let us know if you agree. Read The Blank Page Manifesto.